From Carrabelle I walked all day and into the night toward Panacea. All the people I spoke to along the way kept saying there was nothing between the two towns. First I passed through Lanark. It had been a military base during WWII where they trained for the D-Day invasion. I stopped at the little store there, Nice (the dog) was given a hot by the woman there who had a hot dog cart outside the store. Further on there was a summer camp resort and a state laboratory. I met a man early in the day who offered to give us a ride when we made our way to the lab. It was almost sunset when we got there but the traffic was lite and so was the wind so I kept with my plan to walk the twenty five miles to Panacea by morning. After dark as the road opened for me to walk for long stretches without any traffic I received a call from two women I had met who were concerned, they offered to pick us up if we had any trouble or found a place to stop. Though I had started late that morning I kept a steady pace and felt good until I stopped to rest then my legs cramped making the next hours a little harder. I knew there was a very long bridge a few miles before Panacea, I wanted to get across the bridge while there was no traffic late at night. Itwas good I walked it at night, only four cars passed and it was better that I couldn't see the full length as tired as I was. By that time my muscles ached and I had given up the idea of walking all the way to Panacea. I was going to find a spot over the bridge and rest. To my surprise, after being told there was nothing, I found a campground , restaurant, a gas station and deli in a tiny row of businesses. It was before midnight so I called the ladies who had offered us a ride. Though they had gone to sleep they were glad to come get us as they had been worried about us being stranded. 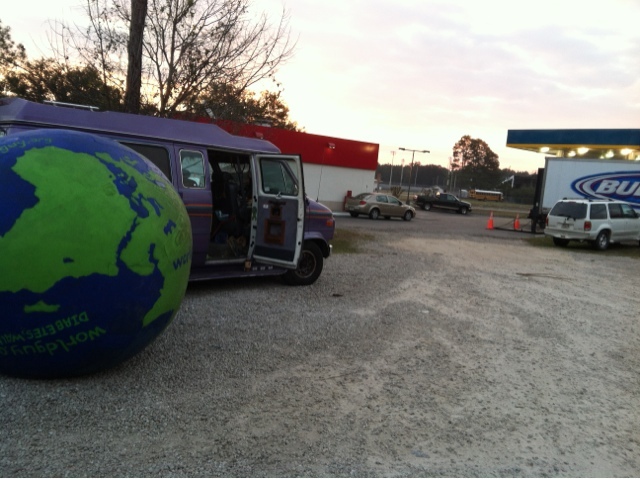 When they arrived I hid the world in plain sight and soon returned with the van where we slept a few hours. In the morning I checked to make sure I could leave the van until later and we walked the last few miles to Panacea. There I was told it was just few miles Menart where I could find a suitable parking area by a local county officer. Still sore and tired from the previous days of walking I was willing to travel six or so miles but at nine miles I was glad I could finally stop. I had stopped for lunch in Panacea where the lunch special was all- you-can-eat fried chicken(grilled was $1 extra, I had a salad and grilled chicken strips). There I met a man who planned to ride us back to the bridge when we had made our way to the stop at the end of the day. While he, his wife, Nice (the dog) and me rode in the cab of his truck back through Panacea with him honking and yelling at friends and relatives, once turning around rolling through grass and gravel to say hello to his brother, he asked if I had met any characters during my travels... I'd met a few. Once I settled down for the evening exhaustion settled in and I realized I had sprained my wrist somewhere along the way. It's not too swollen and I am hoping it will loosen up today. The sun is up and it's time to get ready. My GPS says it is only twelve miles to the next town. Have a great day! We met you yesterday and I do appreciate you bringing awareness to Diabetes! Thanks for allowing me to take a picture of Leland with the World!!! He was so excited to tell his Music Teacher and Dad last night! That made a Big impression on my little Autistic guy!!! I saw you day before yesterday in Lanark Village and also saw your van and world at the store this evening. You must have been resting. I told my children about what you are doing and we think its great!! Best luck and wishes in your travels.